The TEVO Flash is one of our picks for "Editor's Choice" in Winter 2018-19. Check out our review to find out why we chose it. 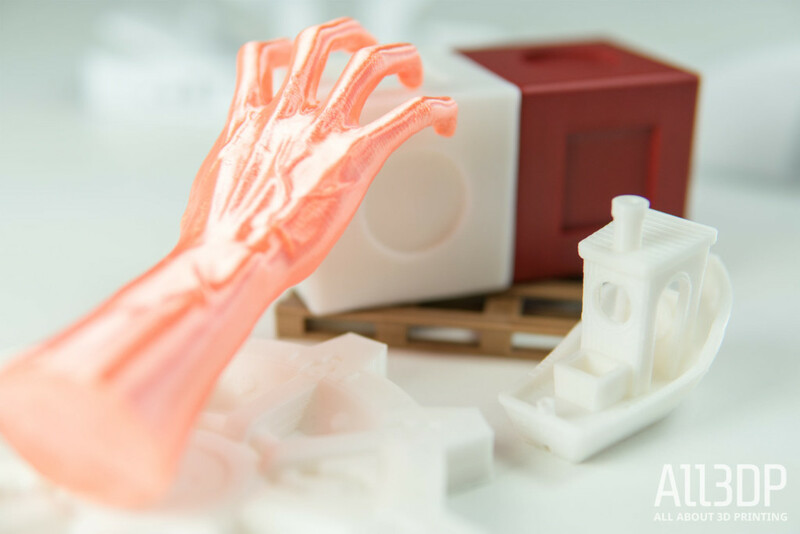 Released in the summer of 2018 around the same time as Creality’s Ender-3, the Anycubic Chiron, the Ultimaker S5 and the Lulzbot Mini 2, you could be forgiven for letting the TEVO Flash pass you by. We were quick to poke fun at the name, thinking it a lawsuit waiting to happen. Little did we know that TEVO was running with an apt name for a printer that chews through filament with abandon. After some weeks of Flash-filled printing, we’re ready to put fingers to keyboard and share our lowdown on this possible sleeper hit. 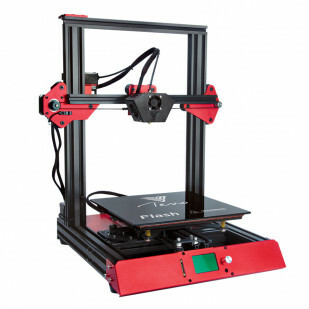 The TEVO Flash is a fused deposition modeling (FDM) 3D printer, with a Cartesian XZ-head frame style that is relatively commonplace in the Flash’s sub-$500 price range. With a tagline that’s one adjective short of a Daft Punk song, TEVO’s “Better, Faster, Stronger” Flash stands apart from the crown with a flashy red color scheme that we must confess to being fans of. It’s a splash of color in a market of dreary stamped out clones. 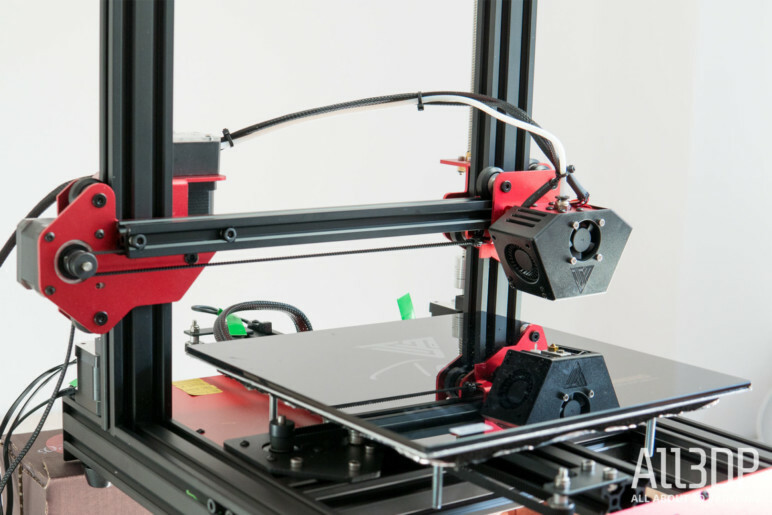 The frame itself is comprised of aluminum extrusions, with a Bowden style extruder system seeing the extruder motor mounted to the end of the X-axis gantry, with the lightweight Volcano hot end receiving filament through a PTFE Bowden tube. 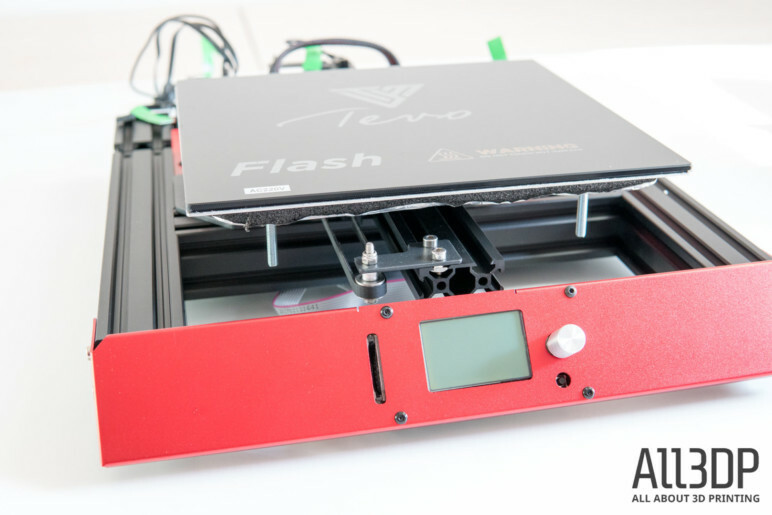 Unusually for printers in this price range, the TEVO Flash is sold in a number of configurations with additional features. These extras are dual Z-axis motors with a coordinating belt, TCM 2100 stepper motor drivers, and a BLTouch bed-leveling probe. Of these different feature configurations, the TEVO Flash is also available in 50% and 98%-built versions. Our review unit is the 98% assembled Flash, featuring all extras. 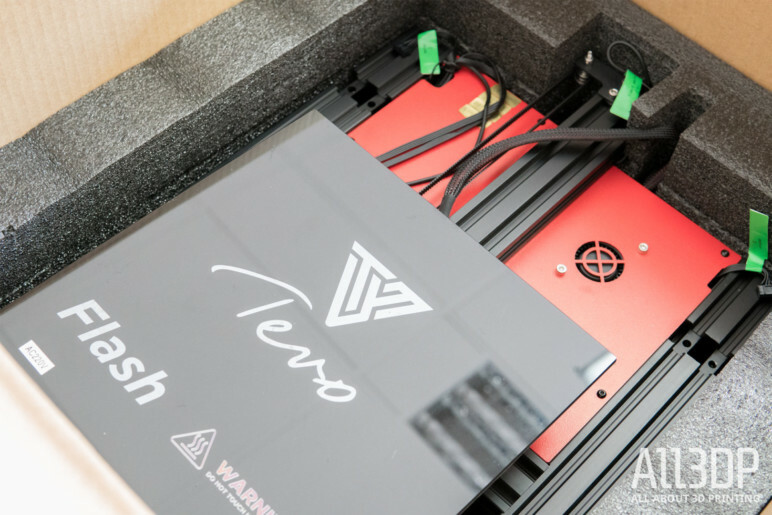 Packaged snugly amid layers of foam and cardboard box, the TEVO Flash arrived unblemished from its journey to the All3PD office. Indeed everything was securely packaged, and, importantly for the 98% version, almost entirely assembled. The 2% of work you are left to do consists mainly of using the provided hex key to screw aluminum extrusions onto the Flash’s base and wire the shrouded cables to their respective ports. That’s it. A simple, fuss-free build that takes all of 10 minutes to whiz through. 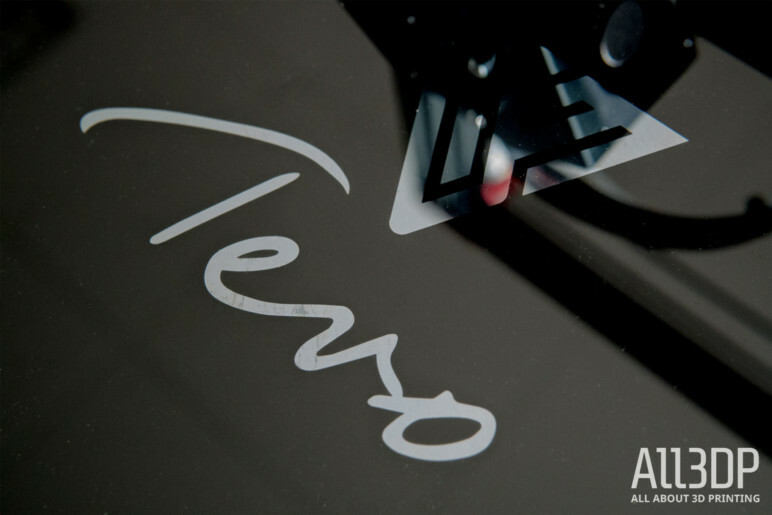 Speaking to the aesthetics, we must admit that we’re fans of what TEVO does with its printers. It’d be too easy to phone it in with rubber color strips inserted into the inactive runners in the extrusions. But TEVO doesn’t appear to follow the pack in this way. Every printer of the company has an identity. For the Flash, it’s all red, with a gorgeous glossy black sheet of glass for a print bed underpinning the whole getup. 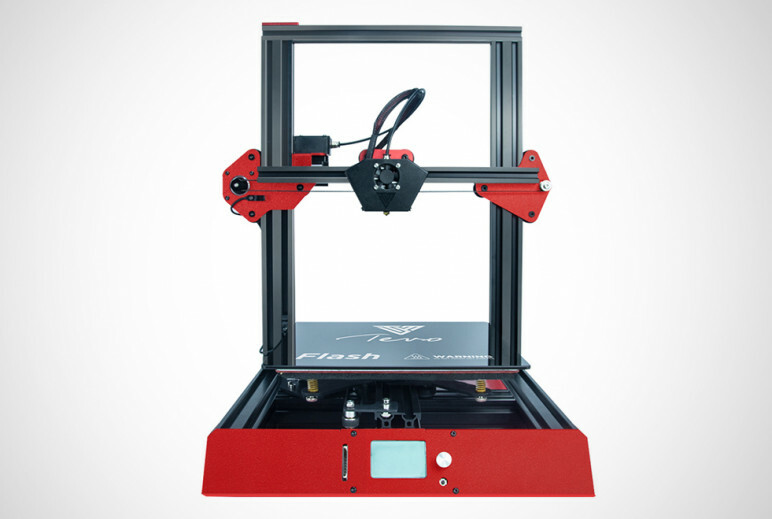 As far as i3 style 3D printers go, it’s a looker. 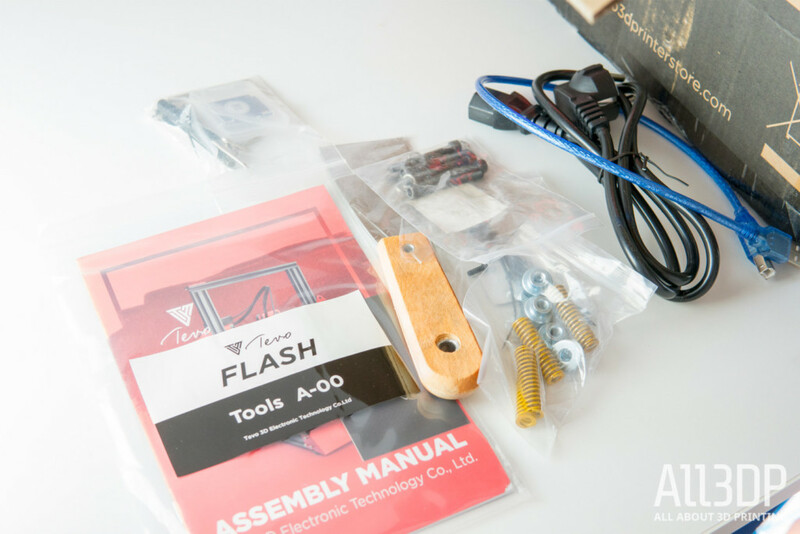 With the majority of electronics and the power supply tucked away inside the base unit, which needs no assembly on your part, the process is straightforward. Something cemented by an instruction manual/build handbook that is clear, concise and helpful. It appears that TEVO is paying great attention to improving it’s supporting documentation because this is light years away from the confusing mess we experienced with the company’s Tarantula printer last year. 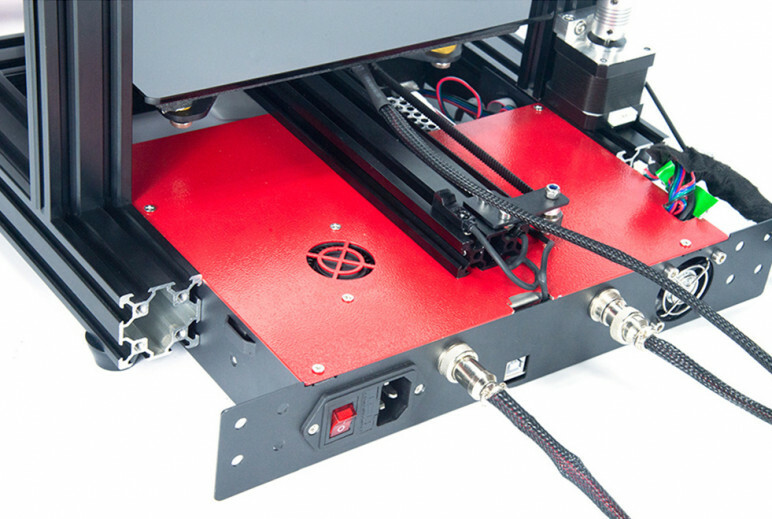 TEVO’s take on the E3D Titan extruder features on the Flash, a welcome addition that does an adequate job pushing filament through the Bowden tube to the hot end. The hot end itself is TEVO’s interpretation of E3D’s Volcano, which features an elongated melt zone to allow for higher and quicker filament throughput. This is flanked by two radial fans that assist greatly in cooling the filament the Flash leaves for dust in its wake. Neat inclusion as it is, the use of a Volcano hot end here is missing a trick by not shipping with larger nozzles. The TEVO Flash comes with a 0.4mm nozzle as standard, which is fine, but won’t take full advantage of the hot end’s improved flow like a 0.8mm nozzle could, for example. As explained, our test unit features all of the optional extras, meaning sitting shotgun on the printhead is a BLTouch pushpin bed-leveling probe that performed without fail throughout our testing, plus a second stepper motor to drive the Z-axis and, sitting pretty between the mainboard and stepper motors, TCM 2100 drivers. That latter feature is a beautiful thing in action; the actual motion of the Tevo Flash is whisper quiet. Unfortunately, this benefit is undone by the ungodly loud control box fan, which drowns everything else out anyway. Seems a missed opportunity on TEVO’s part not to include a silent fan here and gift the Flash near-silent operation. It would surprise no one to think that a good number of inexpensive 3D printer kits occasionally feature questionable implementation of electronics. TEVO has a particular preference for AC-powered heated beds with worrisome wiring. When reviewing the company’s Tornado 3D printer we banged the drum about the lack of safety features to protect you from your building’s power supply should some part of the bed’s wiring fail. That issue carries through to the TEVO Flash, although it is arguably a little less troubling than before. As with the Tornado before, the Flash’s AC carrying cables going into the bed are fixed in place with a hard rubber-like putty shrouding the connection. And again, there’s no strain relief to take the load off this particular stress point. These cables are fixed to a constantly moving part of the printer (the bed, traveling along the Y-axis) and should be bulletproof as far as build quality goes here. Thankfully the heat bed cable is long enough to not snag of the Y-axis extrusion that sticks out toward the rear of the printer — likely by design, with them protruding deliberately off to one side. But still, for peace of mind and the assurance that something is actively taking the load off these cables, strain relief here would be a welcome sight. Well-intentioned though it is, we’re not convinced that a print bed that heats in seconds is necessarily worth the risk, especially when there is an absence of basic precautionary measures to secure it beyond doubt. Our time with the TEVO Flash was also marred slightly by Thermal Runaway error triggering after some few dozen hours of printing. The hotend would appear to reach temperature and begin printing, before dropping some degrees and triggering the error. Fortunately, the problem transpired to be that the thermistor had jostled out of position somehow. Reseating it in the heating block set things right and we’ve had a stable temperature reading since. TEVO Flash Review Flash! A-Ha! High power bed and small easily solvable issues aside, the TEVO Flash has been a fun printer to work with. The inclusion of Volcano nozzle allows more material to be heated at any one time, making the TEVO Flash more than capable of rapid print speeds, which is where we’d say the enjoyment of using the Flash comes from. It heats in a beat, holds its bed level thanks to that slick slab of glass and BLTouch, and whips up prints lickety-split. Past experience with inexpensive kit printers tells us that the more features and extras that are tacked on, the more things will go wrong, but the Flash has held up to prolonged use. Besides the thermistor issue, which had nothing to do with these additional ‘bells-and-whistles’ of the printer, everything works as it should. You have wide material compatibility thanks to the Titan clone extruder and hotbed. After several PLA variants, including such infused blends as eSun’s Bamboo, Prusa Polymers’ sparkly black Prusament and even Rigid.Ink’s Pearlescent Red ABS, we encountered no issues with bed adhesion or extrusion. And speaking of that bed – did we mention just how nice it is? A 235mm-squared slab of inky black gloss with a few branding details in silver. Classy. Perhaps it’s the imagination, but the bed seems to perform abnormally well. PLA prints stick with no adhesive necessary, sliding right off the bed after it has cooled a little. Yes, we hear those of you yelling “that’s how it’s supposed to be.” It doesn’t sound different, but using the Flash bed does feel different from other nondescript borosilicate beds. We even has some success printing ABS on the bare glass, too. We also like the setup guide running the user through Repetier Host. Those with a fondness for how Cura spits out G-code can still use the CURAengine within Repetier, but you also have the flexibility to use Slic3r and others. 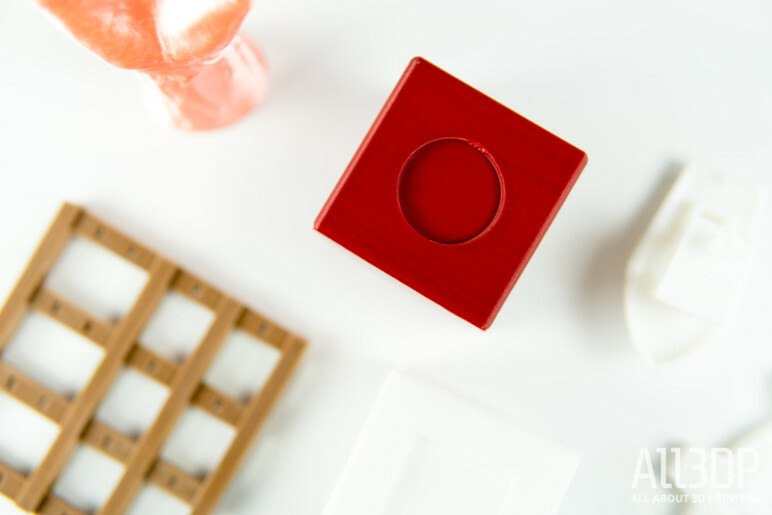 You could argue that Repetier is not particularly beginner friendly, which we’d mostly agree with when compared to the foolproof “easy” settings of Cura — but TEVO’s documentation does a good job walking through the setup, and introducing the basic concepts. So, as established the TEVO Flash is capable of speedy extrusions. But how does this translate to print quality? Pretty well. Depending on the material you use and the kind of models you print the quick default settings for the TEVO Flash hold up surprisingly well. We’ll put the brakes on that thought, however, to say that the out-of-the-box results do not hold up to that of say, the Ender-3, with ghosting being the most notable aberration on models printed on the Flash. Indeed, ghosting — particularly in the Y-axis on our machine — is pretty awful. 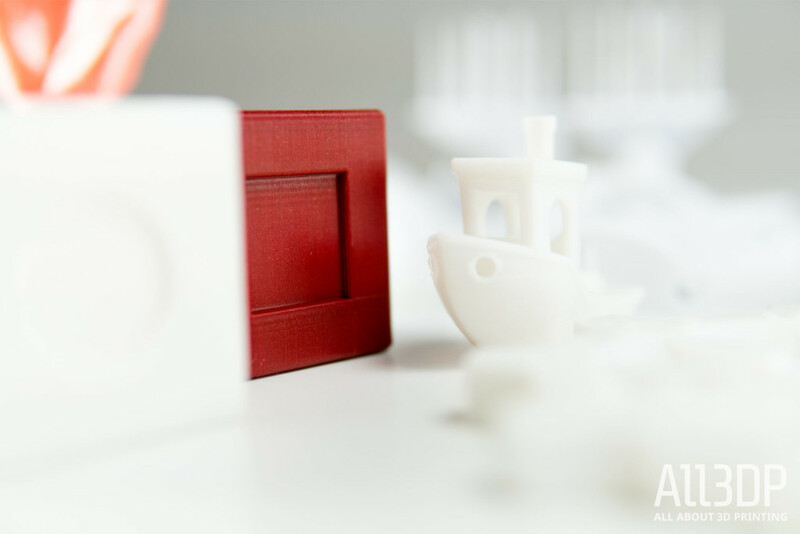 Turning to Kickstarter and Autodesk’s recently published printer calibration model, under the conditions of the test (eSun PLA+ Cool White, default settings — read more here) the TEVO Flash scored an average of 19.5 out of 30. A respectable score, but more an indication of factory calibration rather than the pinnacle of the printer’s abilities. There are steps you can take to minimize the ghosting effect, such as adjusting the jerk and acceleration in the printer’s settings. We have yet to stumble on the perfect solution to 100% eliminate the issue, but with incremental improvements for every belt-tightening and speed adjustment, it certainly becomes liveable. As stated previously, material compatibility is as you would expect. The Flash ate up a variety of filaments without any notable issues. Naturally, for temperature sensitive materials such as ABS and Nylon, an enclosure would be best. 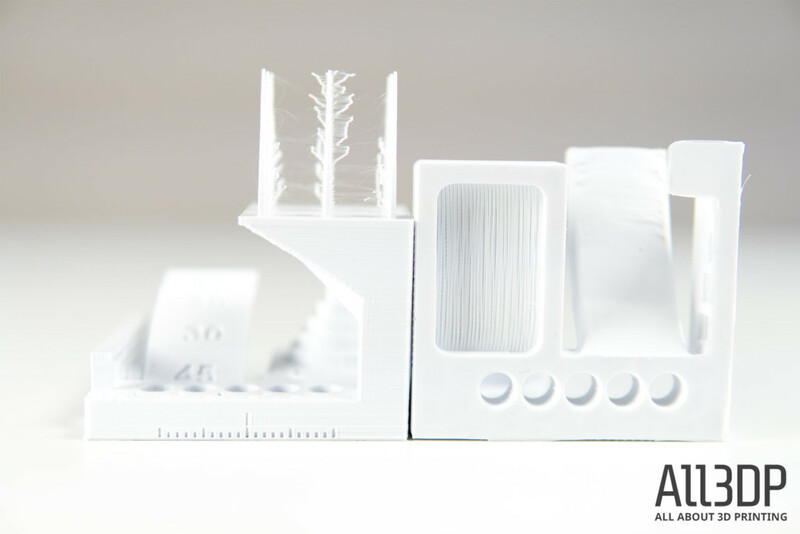 In our experience using the machine, taller ABS prints will crack, and Nylon will initially stick but leap free a dozen or so layers in. Nature of the beast. We managed to print ABS directly onto the Flash’s glass bed without trouble, which is somewhat abnormal. At the very least you should expect to need some form of glue or tape, so we were pleasantly surprised to find it not always necessary for the Flash. TEVO Flash Review Is it Worth It? After some weeks using the TEVO Flash, we conclude that it is a fun printer to use. Not since the Biqu Magician (another flawed, but ultimately fun and feature-packed printer) have we enjoyed printing for the sake of printing. Quality of life features such as the automatic leveling work well, and take the effort out of print preparation. The bed is lovely, albeit still suffering from the same lack of precautions as TEVO’s other AC-powered heated beds. 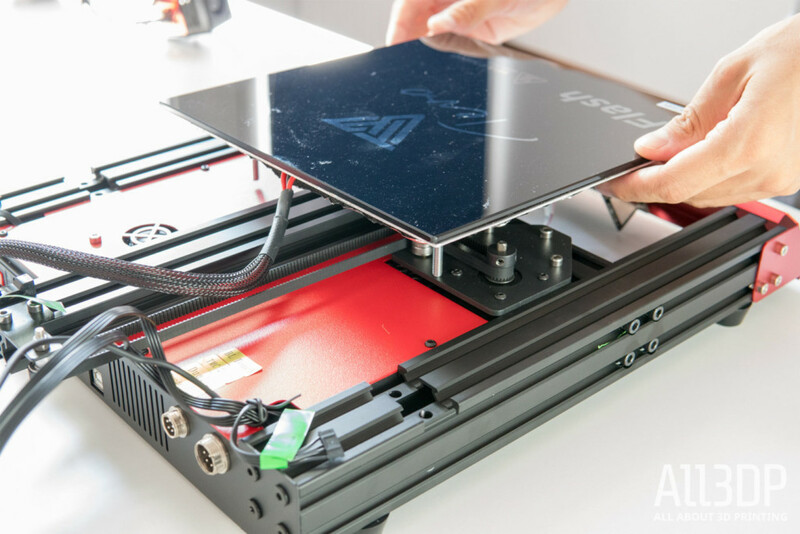 Some small progress has been made over the Tornado – the last TEVO printer we reviewed – but we still strongly recommend safeguarding it yourself before setting the machine up for the long haul. For day to day printing the Flash guzzles filament with ease, producing pleasing results with its standard settings when weighed against the speed at which it prints. Ghosting is ever present and ugly, but fine tuning and neutering the print speed somewhat can reduce this. Would we recommend the TEVO Flash for those looking for out-of-the-box print quality without breaking the bank? No. Get an Ender-3 instead. Those with a little more moolah to drop in the sub-$500 range that wants a printer with personality could do a lot worse than the TEVO Flash. We certainly had a blast reviewing it, and for the feature set, distinctive looks, and baseline prints it gets our recommendation. 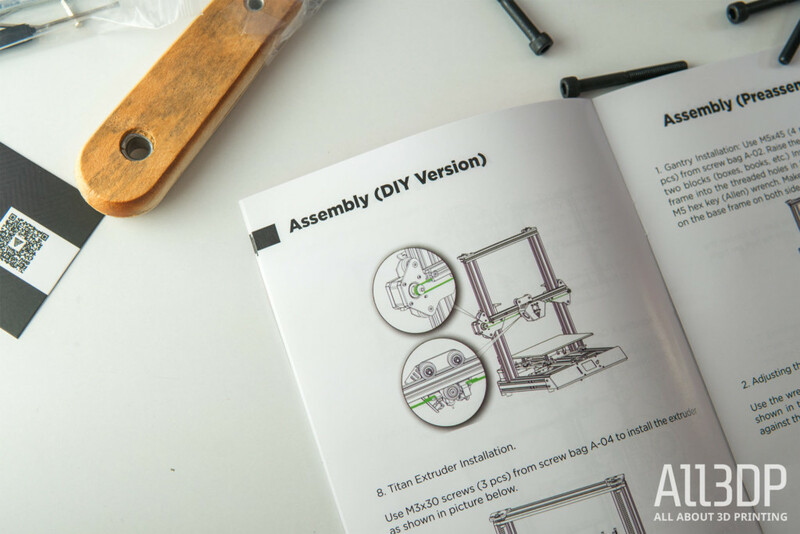 Heck, we’ve even deemed it an Editor’s Choice pick in the Winter update to our Best 3D Printers guide. You can pick up the TEVO Flash from the retailers listed below. 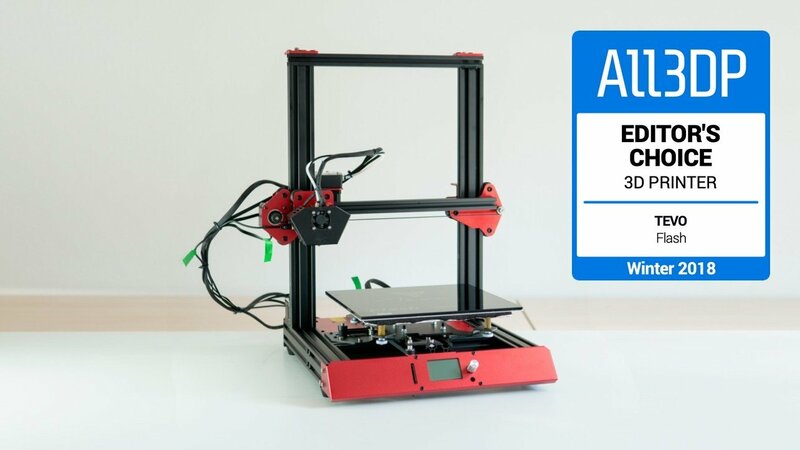 License: The text of "2019 TEVO Flash 3D Printer Review – Editor’s Choice" by All3DP is licensed under a Creative Commons Attribution 4.0 International License.